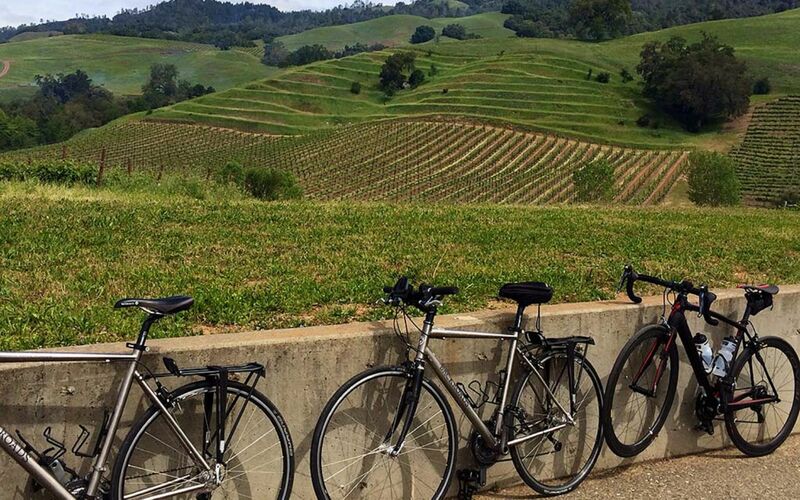 With over 60,000 acres of vineyards and miles of pastoral countryside to explore, a Sonoma bike tour is one of the best ways to take in the scenic views. Whether you’re a seasoned cyclist or a casual rider, the bike trails in Santa Rosa are a perfect outdoor recreation option, with many of the best bike tours near the Sandman. Bring your love of wine and biking together with a unique “Sip & Cycle” tour of Sonoma Valley vineyards. Getaway Adventures has been giving guests one-of-a-kind trips throughout Sonoma and Napa Valley for over 25 years. Join the tour to see the quaint side of wine country and to explore what it means to take life one mile at a time. Contact the hotel front desk for more information or call Getaway Adventures directly at (800) 499-2453. Advance reservations are required for any of the tours. For casual and family riders, take a leisurely ride through one of the many easy and moderate bike trails in Santa Rosa found in nearby regional and state parks including Annadel State Park, Spring Lake Regional Park, Nagasawa Community Park, and Shiloh Ranch Regional Park. Consult the city’s creek trail system map to find some of the best and most scenic bike trails in Santa Rosa for beginners.